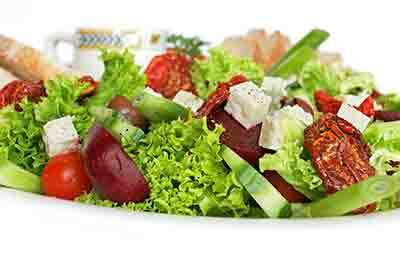 A Salad for Knee Pain? Anti-aging developments -- January 21, 2011 -- Starting each meal with a small salad is recommended to keep your hands and knees free of osteoarthritis, according to a recent report by Real Age. Greens are loaded with vitamin K, a vitamin your body needs to fight off this debilitating disease. So eat cabbage, spinach, and swiss chard, green salads and any other leafy green vegetable on the market. Get a Grip on ArthritisReal Age reports that "In a study of older adults, those with higher blood levels of vitamin K were significantly less likely to develop the bone spurs and cartilage damage that are common in painful osteoarthritis. Hands seemed to benefit most, but people's knees got some protection, too. " However be careful if you're on blood thinners to check with your doctor about appropriate K intake. Anti-aging developments -- January 20, 2011 -- In a study of women and breakfast, women who had cereal for breakfast every morning experienced greater self-esteem than the women who started their days with a muffin -- even though both breakfasts had the same number of calories. Mind over Food"The cereal eaters felt fuller, happier, and more relaxed, according to food diaries the women kept to record how many calories they thought they'd had and what they felt after eating it. Even though both breakfasts had 400 calories, women who ate the cereal thought it had fewer calories -- and they felt better about themselves because of it. "And a mood boost like that is good for self-esteem", researchers noted, "because how people feel is closely linked to their perceptions of their weight and body image." Anti-aging developments -- January 20, 2011 -- According to a report i just received a daily lose dose aspirin after a "certain age" lowers the risk of colon cancer. Recent studies have shown that for middle-aged people a daily aspirin reduces the risk of getting colon cancer by up to 25%. of dying of the disease by 35% and of getting cancer of the proximal colon, which is apparently, harder to detect by 70%. Worth Considering when combined with the other health benefits of cancer mentioned elsewhere in this site. like reduced risk of stroke and heart attack. 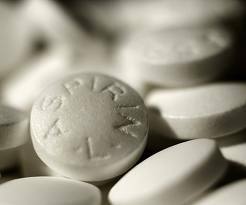 However, aspirin is not recommended for everyone, the health benefits only apply to certain age groups and side effects can be problematic in some people, leading to ulcers and brain bleeds. Therefore, you should consult your doctor and ask him about this, rather than self medicate. Anti-aging developments -- January 20, 2011 -- Sweet Poison Carbohydrates are starches and sugars and the easiest way to think about them is to split them into two groups fast and slow releasing. Slow release carbohydrates tend to be plant foods such as grains, beans, fruits and vegetables. The fast releasing ones will cause a rapid rise in blood sugar, followed by a drop and the subsequent release of stress hormones. A food that has sugar added to it becomes fast releasing. Look out for sugar on food labels. 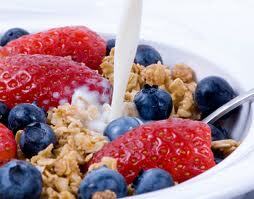 A small pot of fruit yogurt, even a healthy organic live fruit yogurt, can contain as much as eight teaspoons of sugar. Be vigilant. Sugar is added to savory foods like tinned vegetables, baked beans, tomato ketchup, soups and even pasta sauces where you might least expect it. If you really want to get rid that weight around the middle you need to cut out all sugars completely - except for the odd bit at birthdays and special occasions. Anti-aging developments -- January 20, 2011 -- Some messages coming out of your mouth bypass the vocal chords. Turns out that your teeth, gums, and surrounding tissues also have plenty to say -- about your overall health. Flat, worn teeth and headache -- Sign of: Stress Many people are surprised to find out they're tooth-grinders. You might be doing it in your sleep. Sores that won't go away -- Sign of: Oral cancer When an open sore in the mouth doesn't go away within a week or two, it always warrants showing to a dentist or doctor. Gums growing over teeth -- Sign of: Medication problems This can be caused by medication for heart disease or seizures, or drugs that suppress your immune system. Dry mouth -- Sign of: Sjogren's Syndrome and/or Diabetes Many things can cause dry mouth, but a lack of sufficient saliva can also be an early warning sign of two autoimmune diseases -- Sjogren's syndrome and diabetes. White webbing inside cheeks -- Sign of: Lichen planus This mild skin disorder tends to strike both men and women between the ages 30 and 70. Crusting dentures -- Sign of: Potential aspiration pneumonia Aspiration pneumonia, often caused by inhaling debris around the teeth and dentures, is a leading cause of death in older people. Anti-aging developments -- January 20, 2011 --Poor Oral Health is Linked to Heart Disease The link between gum disease and heart disease may not be obvious, but chronic inflammation is a hallmark of both conditions and inflammation in your body plays a major role in the build-up of plaque in your arteries, which can lead to a heart attack. A study published earlier this year concluded that the frequency of teeth brushing can actually have a significant impact on your risk of developing heart disease. They found that those with the worst oral hygiene increased their risk of developing heart disease by 70 percent, compared to those who brush their teeth twice a day. This finding is yet another potent testimony to the fact that heart disease is a condition that can be prevented, most of the time, by leading a healthy lifestyle -- which includes the simple act of brushing your teeth regularly to prevent periodontal disease. But just how can periodontal disease trigger heart disease? It's important to realize that periodontal disease involves both bone and the tissue that is in contact with that bone. From this contact, bacteria and toxic, inflammatory compounds can easily enter your blood stream. Once in your blood stream, these toxic compounds can harm the lining of your blood vessels, which can lead to both strokes and heart attacks.